Trim all tree branches, shrubs and vines periodically, so the branches do not touch or come close to your house siding or roof surface. The sun should be able to dry out those hidden areas so wood boring insects do not become attracted to the moisture that can accumulate if it's hidden with vegetation. 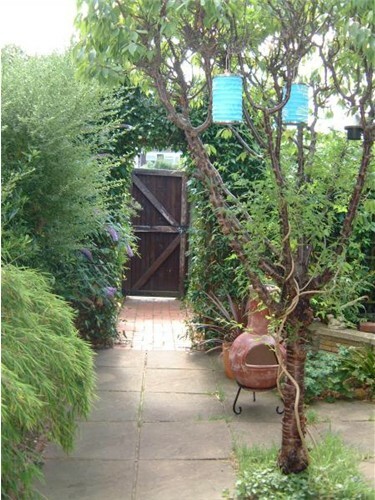 Tree branches and vines also provide wood boring insects an easy path to your home. Wood boring insects also thrive on dead wood that may be lying around your property. So, remove any tree stumps and dead trees that are within 50 feet of your foundation and store all firewood off the ground and away from your home. At the same time that your preventing wood boring insects from infesting your home, you'll want a safe home. So don't allow your shrubs and trees to provide cover. Cut back all tall shrubbery near your doorways and walkways as well as any plantings that block any windows. Try to keep all your plantings trimmed to a height of 3 feet or less. Also, trim any trees or shrubs that block the view to your neighbor's homes. Privacy issues aside, you'll want your neighbors to have a clear view of your home's doors and windows. You may be asking yourself...Why? When and while your away, any strange activity that may be going on inside your home can be clearly observed by your neighbors.